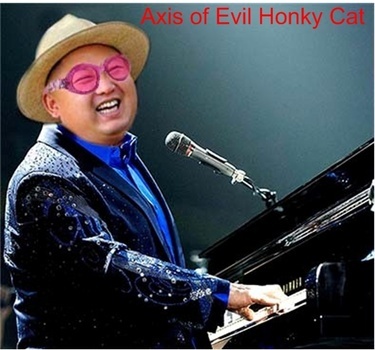 Mr. Kim added to enjoyment at his nightclub with, "All we are saying, is give peace a chance . . ."
Breaking: Following the recent triumphant meeting of Moon Jae-in and Kim Jong Un, leaders of South and North Korea, Mr. Trump has flown to Mr. Kim’s yacht in the East Sea for further negotiations. Mr. Trump is aboard Mr. Kim’s yacht, The Kim Il-Sung III, built along the lines of billionaire yacht cruisers. It also has several dining rooms and a nightclub, adequate for the high-level meeting on possible peace between North and South Korea and the United States. For security, Kim’s yacht is surrounded by three aircraft carriers with their battle groups. Jets are taking off from one aircraft and landing on another throughout the meeting. Helicopters rise and descend. The carrier groups are commanded by: Secretary of State Pompeo; National Security Advisor Bolton; and Secretary of Defense General Mattis. Reports from aboard indicate the meeting is proceeding smoothly, with good promise. One possible blemish not yet available to international press is broken here. In a nightclub evening, with Mr. Kim and his sister and Mr. Trump and Melania, Mr. Trump was introduced to several females performing on stage in short and snug body-revealing outfits. Melania dug her fingernails deeply into the palm of his right hand, which he keeps cupped at this time. On another significant day Mr. Trump awoke with his hair somehow swept up and forward, so that he thought to himself he resembled an orange rhinoceros. Despite this ominous beginning, the day went well, with one mysterious development. There a number of sharks could be seen hovering and swimming around just below Kim’s craft. “Some Americans say you know when a North Korean politician is lying because his lips are moving. “Iranians say you know when an American politician is lying because his lips are moving. However, military analysts indicate this mysterious comment means Mr. Kim will keep a weapon in reserve, after giving up his nuclear weapons. And these trained beasts could enter the seas off New York if necessary. At this time this historic meeting continues with Mr. Trump in consultation with Pompeo, Bolton, and Mattis in his quarters.